From time to time, you may notice cat loss of appetite. If there are no other symptoms, it’s safe to wait a few days and see if your kitty’s appetite returns. However, if cat loss of appetite is accompanied by other symptoms, you should consult a veterinarian. If you notice your cat throwing up or having diarrhea for more than a few days, there may be a serious underlying cause. Parasites like whip worm, roundworm, hook worm or tape worm cause these symptoms as well as weight loss and weakness. These parasites should not be confused with ringworm in cats, which is actually a skin fungus. If you observe cat loss of appetite and you notice that you have a very lethargic cat, there may be some organ disease. 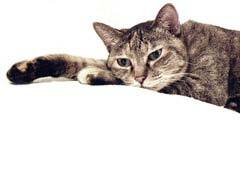 Pancreatitis and diabetes affect cats just as these diseases can affect humans. These are serious medical conditions that require treatment. Green bile in the vomit is an indicator of pancreas disease. One of the most common cat vomiting causes is a hairball. When your cat grooms itself, it ingests hair. When hair builds up, the cat vomits a hairball. Cats are curious creatures. They sometimes eat things that they can’t digest. These items are also vomited. Other causes of cat loss of appetite and vomiting include food allergies and ingesting toxic substances. Even if your cat has never had food allergies before, she can develop allergies at any time. Some common house plants like Easter lilies, philodendron, oleander, geranium, English Ivy, lily of the valley, foxglove, asparagus fern, bird of paradise, clematis, and baby’s breath are toxic to cats. Cats have been known to lap up antifreeze which is also toxic. Your cat will also vomit due to intestinal infections like giardia and salmonella. While occasional loss of appetite and vomiting are usually nothing to worry about, if your cat vomits repeatedly and its symptoms persist it is best to seek medical treatment.